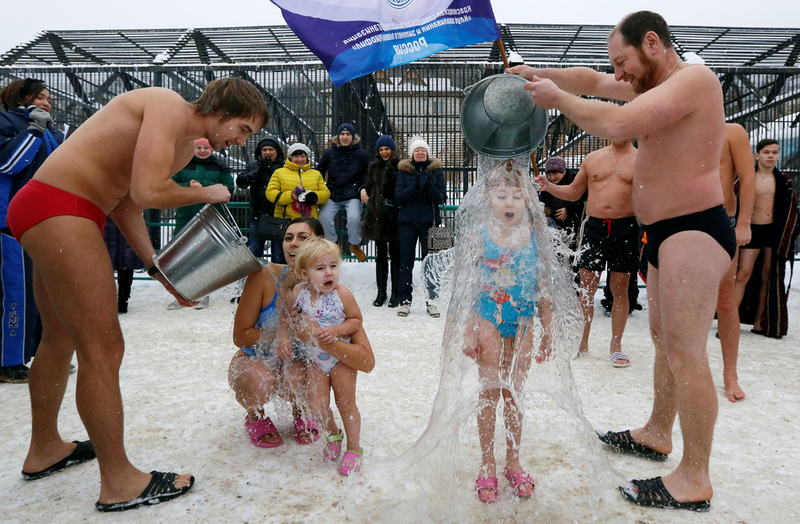 Visitors watch as members of a local winter swimmers club pour buckets of cold water over their daughters, 7-year-old Liza Broverman and 2-year-old Alisa Smagina during a celebration of Polar Bear Day at the Royev Ruchey zoo, with the air temperature at about minus 5 degrees Celsius (23 degrees Fahrenheit), in Krasnoyarsk, Russia, November 27, 2016. Whatever the adults are doing, it is senseless to pour cold water on 2 years old child!! The day is dedicated to learning more about polar bears and the dangers they face. The polar bear is related to the brown bear and probably evolved from brown bears which became isolated from the rest of their species. Brown bears and polar bears can mate and produce offspring which can reproduce. The Alaska Brown Bear and the polar bear rival each other for the distinction of being the largest land mammal. Despite their similarities, brown bears and polar bears are unable to survive in each other's habitats. Polar bears are so adapted to cold that they can’t take temperatures above 50 degrees. There are about 25,000 polar bears worldwide, but their population is declining. Pollution and poaching are a problem, but global warming is the polar bear's biggest enemy. Its habitat is disappearing, since sea ice is not as prevalent and the seals the polar bears feed on are dwindling. The summer ice loss in the Arctic is now equal to an area the size of Alaska, Texas, and the state of Washington combined. o, with the air temperature at about minus 5 degrees Celsius (23 degrees Fahrenheit), in Krasnoyarsk, Russia, November 27, 2016.